September normally promises cooler autumn breezes, but right now the weather's feeling more like August. 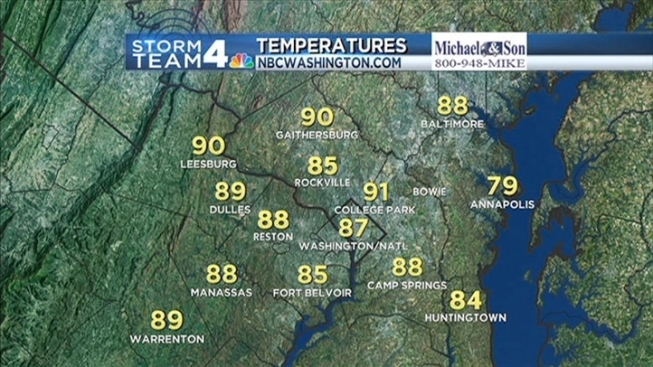 Wednesday marks day two in a predicted three-day heat wave in the D.C. area. Compared to Tuesday's heat index of around 100 degrees, Wednesday will be just as hot -- if not hotter -- than yesterday's scorcher, said Storm Team 4 Meteorologist Veronica Johnson. At 1 p.m., the heat index was already at 99 degrees. At the University of Maryland, students and staff have been asked to cut electricity use Wednesday due to a power grid problem caused by the heat. Schools in Baltimore city and county will close two hours early Wednesday, reported the Baltimore Sun. Hot and humid air up from the South is pouring into the Mid-Atlantic, resulting in afternoon highs in the low to mid 90s, and heat index values close to 100 degrees. The added humidity also means that overnight lows will hover around 70 degrees. The steamy set-up will last through Thursday before a strong cold front arrives, bringing with it a 50 percent chance of thunderstorms. The D.C. area has not experienced three consecutive 90+ degree weather days in September since 2010.